Bottom Line: one of the most popular bookshelf speakers for 5 years running. Good design, specs, warranty, and convenience at a really great price. Probably best for a computer/desktop, and might under perform as full fledged home theater speakers without a subwoofer. 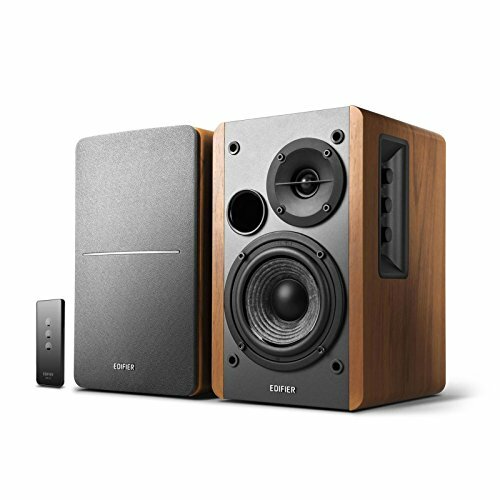 Edifier, a newer and lesser known company, produces a wide variety of bookshelf speakers, and the R1280T, released circa 2014, still remains one of the most popular budget bookshelf speakers on the market. The R1280T are powered, meaning you don’t need an amp/receiver – just plug them in directly to a standard 3.5mm or RCA input (which pretty much covers just about any source) and you’re good to go. dual RCA, RCA to 3.5mm, and speaker cross-wire comes included. 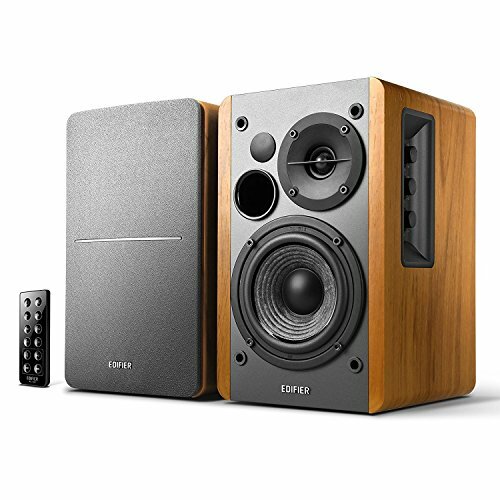 At 21 W of continuous power (each), these will sound good at short to mid distance, but will probably fall comparatively short at full “home theater” distance – these are clearly suited to be computer or desktop speakers. The response range is decent, but somewhat lacking on the floor. Also interesting is that they use a +/- 9dB variance when 3 dB is the common standard – while it’s better that they specify that at all (many speaker companies don’t), a higher response variance is less desirable because the reproduction will be quieter at the extremes of the range. The R1280Ts won’t have the bass that bigger traditional speakers will have, but this is a common concession with budget speakers, and not necessarily a deal breaker mind you. Depending on what you’ll be listening to, you might not need maximum bass. Two nice features, otherwise: the large-ish cabinet with a front-port, which helps with volume, and a 2 way design with a dedicated tweeter and woofer, which helps with even reproduction mainly across the mids and highs. These are two nice features that, together, aren’t all that common on a powered bookshelf speaker that’s as cheap and compact as the 1280T. They look nice too, quite slick for budget speakers – the walnut sides with rounded corners and the vinyl front go well together, and you can choose whether or not to keep the covers on or expose the drivers. Edifier gives 2 years of coverage on all its speakers, which is actually quite good for a powered speaker (so the electronics are covered too) that’s as cheap as the R1280T. We’re not surprised at how popular these remain to be – if you’re looking for an inexpensive, easy to set up, out of the box pair of bookshelf speakers, the R1280T brings a lot to the table with no real weaknesses for how low of a price they go for. You might also consider Edifier’s R1700BTs as an alternative (reviewed here) – they have Bluetooth, as well as slightly superior specs and design, but are a little more expensive. Edifier also recently released an upgraded version of this speaker, the 1280DB (review/comparison forthcoming), but other than a new color and a slightly improved response floor, they seem like they’re basically the same. For that reason, as long as the R1280Ts are cheaper, we say just save some money and get the older one. Polk’s similarly popular T15s (reviewed here) have superior specs and are a little cheaper, but, they’re passive, meaning you can’t just plug in and play – they’ll need a receiver and won’t work as computer speakers, for example. Speaking of which, if you’re looking for full fledged home theater sound, you might want to consider a traditional 2.1 set up with a receiver and the option of an additional subwoofer, but that will run around $500 at a bare minimum. No wrong choice really, just a matter of what your priorities are.